Have you eaten too many chocolate bunnies and deviled eggs lately? 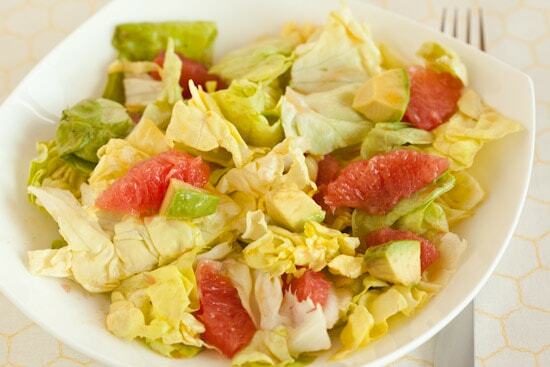 This pink grapefruit and avocado salad is a delicious way to transition into healthier spring eating. We’re actually on the tail end of citrus season around here, but the ruby grapefruit that arrived in my CSA box reminded me of this salad I made last year and I had to finally share it with you. The grapefruit vinaigrette with honey and coriander is so delicious on its own that I kept the salad nice and simple. I tossed together some butter lettuce, chopped avocado, and grapefruit segments and it made a perfect light lunch. 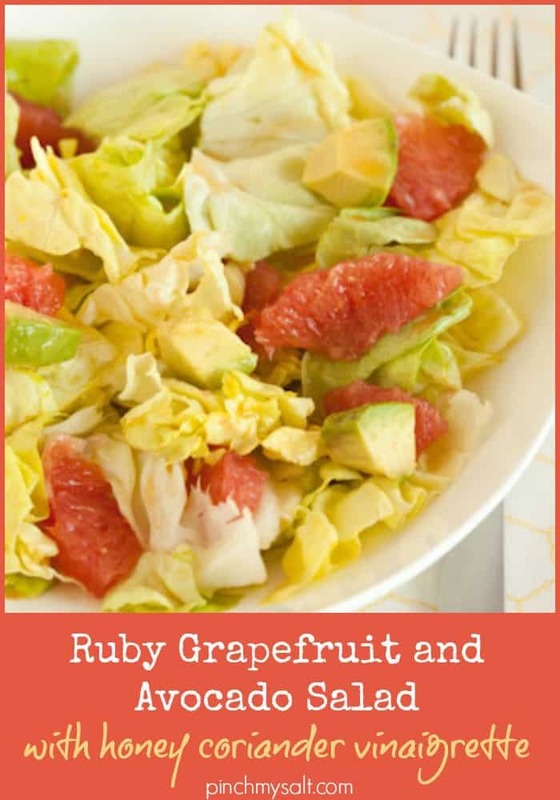 You can use any variety of grapefruit to make this salad, although you may want to adjust the honey in the dressing depending on how sweet, tart, or bitter your grapefruit is. If you peel and section one grapefruit and save the juices over a bowl, you should end up with enough collected juice for the following dressing, which makes enough to dress a lunch salad that serves one or two. Double or triple the salad dressing recipe using more grapefruit for a larger salad. If you’re not a fan of green salads, this dressing would also be delicious drizzled over an arrangement of sliced avocados and grapefruit segments. Add some fennel if you’re craving crunch! Whisk all ingredients together in a small bowl. Toss with your favorite green salad—I suggest butter lettuce, grapefruit segments, and avocado. This makes enough dressing to serve two people. Double or triple the dressing recipe for a larger salad. *This amount of honey makes a sweet dressing—if your grapefruit is very sweet, start with less honey and sweeten to taste. **I used McCormick Gourmet brand roasted ground coriander, but you can also toast some coriander seeds in a dry skillet until fragrant then grind in a spice grinder or clean coffee grinder to make your own. Oooh, I'm intrigued...Grapefruit and avocado are two foods that I LOVE but would never think to pair. This looks delicious enough to make me want to try them together! Grapefruit & avocado are so lovely together! Love that you have a mustard in the dressing to go with it! The dressing looks amazing.. Will give it a try! Grapefruit and avocado? Well if you say so, I do like them both, I'll give it a try. Summer is coming to Las Vegas where I live and it gets really HOT out here. This is a sure winner salad for cool and refreshing this summer! Nice recipe! Looks delicious!! The colours are amazing! Thanks for the great recipe and excellent photos, very much appreciated. I'm sure this dressing would be good on salads, but I added a bit more coriander and grapefruit juice and served over shrimp and rice; a very tasty combination. Thanks for the inspiration! Thanks for the great recipe and excellent photos, very much appreciated! There is no grapefruit juice on the ingredients list. Do you use the juice from your grapefruit to make the dressing?